Everyone's heard someone say, “We'll sit down and have a heart-to-heart.” Are they about to have a casual conversation about nothing important? No, they're about to have a very serious conversation about something that matters a great deal. So the heart is very important. But what is it? The Catechism of the Catholic Church gives us a truly beautiful definition of the “heart” in its section on prayer. “The heart is the dwelling-place where I am, where I live; according to the ... Biblical expression, the heart is the place “to which I withdraw.” The heart is our hidden centre, beyond the grasp of our reason and of others; only the Spirit of God can fathom the human heart and know it fully. The heart is the place of decision, deeper than our psychic drives. It is the place of truth, where we choose life or death. It is the place of encounter, because as image of God we live in relation: it is the place of covenant” (CCC 2563). In a special and deep sense, the heart is the person. Mary’s Immaculate Heart is Mary. Jesus’ Sacred Heart is Jesus. But the heart is also the place of covenant — the place where relationships are formed in the human person, where we become fathers and mothers, sons and daughters, husbands and wives, Catholics and children of God. The heart is the place where we remember our love for our families and friends, where love abides. The heart is the place where our loved ones live. On this day, the first day of our New Year (although the Church had already begun her liturgical year on the First Sunday of Advent), the Church invites us to enter into the heart of Mary, the Blessed Virgin Mary, whom we honour today with the most august title of Mother of God. To be drawn into the heart of Mary, is to learn how to contemplate and love her Beloved Son, Our Lord Jesus Christ, whom she bore and whose nativity we celebrated eight days ago. In very few words, our Gospel reading tells us much about our Blessed Mother. With great serenity she contemplates the wonderful things and the difficult things that surround the birth of her Divine Child. St. Luke tells us that she “treasured all these things and pondered them in her heart.” She studies them, ponders them and stores them in the silence of her heart. She contemplates: she contemplates the good, the confusing, the unknown – everything about her Divine Child; she contemplates. As one gazes into her immaculate heart, which does not only represent the heart of a mother but indeed of the whole Church, we will soon recognise a deep pedagogy of love. To enter in the School of Mary, St John Paul II tells us, is “to put ourselves in living communion with Jesus . . . through the heart of his Mother” (RVM, 2). Today, much of the love that we know and encounter is external. Love is seen demonstrated by the expensive and opulent gifts which we heap on each other. This kind of love depends constantly on strong emotions, passions and of course, lots of money. This is a love that only appreciates external beauty. But Mary teaches us that much of true love lies hidden and mysterious. Even though the fire of passion cools, the beauty of youth fade, the happiness bought by wealth disappears, love remains. It takes prayerful contemplation to recognise what seems invisible to the eye. The Blessed Mother teaches us the art of love which is contemplation. To contemplate is to look with the heart, to look with love. It is only if we contemplate with love can we discover both the tenderness and the greatness of God’s love. This is the reason why we need to contemplate with the Heart of Mary: to read, understand and penetrate the mysteries of Jesus with the love of Her Heart. So what does Mary teach us of love through contemplation? The first fruit of contemplative love which Mary reveals in today’s gospel is this ‘Love means letting go.’ Though, parents have the right and privilege of naming their child, Mary and Joseph took the name given by God through the angel Gabriel, “Jesus”, “God saves.” In her contemplation she recognises that this child does not belong to her. He belongs to God. Mary understood from the very moment the angel announced his conception in her womb, she would not be able to force or manipulate the direction of his fate. This child comes from God, he will live a life in accordance with the will of God and when his earthly mission is accomplished, he will return to God. Mary’s love would provide space for her Son to fulfill his mission, even though this would mean breaking her heart at the end. Letting go doesn't mean we don't care or that we’ve given up. Letting go means we stop trying to force outcomes and make people behave. It means we stop trying to do the impossible--controlling that which we cannot--and instead, focus on what is possible for God. The third fruit of contemplating Mary’s love is that Love purifies or to be more accurately, it sanctifies. To be worthy to become the Mother of God, Mary had to be the Immaculate Conception, the true Ark of the Covenant unsullied by original sin, the bearer and temple of the Lord, her son Jesus. Her holiness finds its source in the love of God that had consumed her from the moment of conception. St Augustine tells us that Mary’s love first conceived in her heart and then in her womb. So what is the single most important sign of sanctity? It is love. Scriptures constantly remind us that the beginning of love does not lie with the individual man or woman trying to be more altruistic or caring. The beginning of love always begins with God’s love for his people even though they remained sinners. The love of God divinises the beloved and thereafter the beloved transforms the world and sanctifies it through this same love which he had received. As we begin our New Year with this beautiful feast, let us contemplate the profound words of St Anselm’s homily on the role of Mary in God’s plan of salvation, “To Mary God gave his only-begotten Son, whom he loved as himself. Through Mary God made himself a Son, not different but the same, by nature Son of God and Son of Mary. The whole universe was created by God, and God was born of Mary. God created all things, and Mary gave birth to God. The God who made all things gave himself form through Mary, and thus he made his own creation. He who could create all things from nothing would not remake his ruined creation without Mary. God, then, is the Father of the created world and Mary the mother of the re-created world. 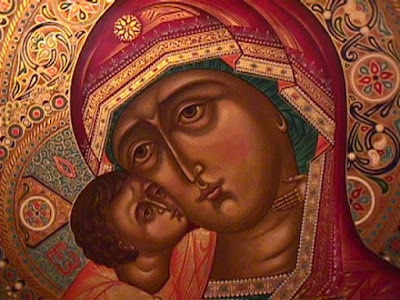 God is the Father by whom all things were given life, and Mary the mother through whom all things were given new life. For God begot the Son, through whom all things were made, and Mary gave birth to him as the Saviour of the world. Without God’s Son, nothing could exist; without Mary’s Son, nothing could be redeemed.” Ave Maria!